How can I increase my Alexa rank fast? Are there any tricks or tips that will help to boost your Alexa Ranking? Does the Alexa Rank even matter? Do many people search on the internet for How to improve my Alexa Ranking? We understand how important this figure is for you and your business website. Every website owner wants to get good Alexa rank for own website or blog. Alexa.com Gives The Global rank and Country rank of based on how much visitors come daily on the website, high-quality links, unique content etc. Alexa rank evaluates the value of your website or blog. Before we start How to Improve Alexa Rank Quickly in 2019, we should take a step back. It’s important to understand the makeup of the Alexa Rank so you understand how you can make it better. What is Alexa and What is Alexa Rank? Which factors does Alexa analyze? Alexa is a product of Amazon and web analytics company owned by Amazon. 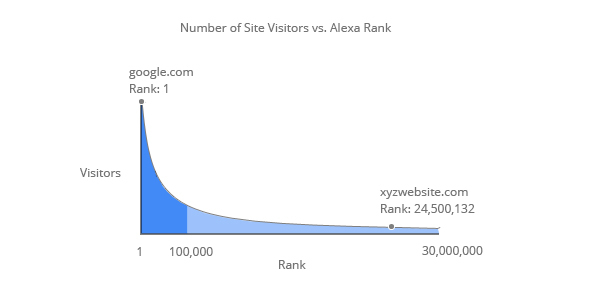 Alexa maintains the ranking of websites/blog according to their performance (Like- Daily visitor, content, quality links etc). The Global Alexa Rank indicates how much your site is popular around the world and the Local Alexa Rank shows popularity in the country that the domain has been registered in. In the case of a website or blog, the daily number of traffic (visitors) and page views decides the Alexa ranking on websites. “It’s a ranking system set by alexa.com (a subsidiary of amazon.com) that audits and makes public the frequency of visits on various websites. Google.com receive a very high amount of daily visitors and page views, so it sits at the top of the mountain. Bounce Rate and CTR (Click-through-rate). Learn how to increase your CTR. Content is the king and the main part of any website. If you use quality content for any website as well as link submissions (Off-Page SEO) then definitely your Alexa rank will definitely increase. Submit your website on major Search Engine Directories. Guest posting is one of the most important and beneficial parts to post quality content on another blog so that you will get more and more search engine traffic on your website/blog which helps you to increase Alexa ranking easily. Here, good backlinks mean = Do Follow backlinks. PR (Improve) = Website is capable enough for sponsorship, affiliate marketing etc. Install the Alexa Toolbar on multiple browsers (Chrome, Safari, Firefox, etc). Download your favorite VPN (I like tunnelbear) and connect to it. Go to page refresh website PageReboot on every browser, put your site and set the refresh time every 60 seconds. Sit back, relax, read another one of my blog posts, and wait for approx 10-15 min. You can change the country in Windscribe now. (Optional but recommended if you have the budget) Get your Alexa page certified by buying one of their plans. For best results, do this at different times of the day and also change your IP Address every 10 or so minutes. Your Alexa Rank should update every day if you have a rank < 100,000 or every week otherwise, so expect to see the results of the boost in about two weeks or so. So there are some ways to increase your Alexa.